Our big idea: To update our product to have both zapper circuits ever published by Dr. Hulda Clark in one unit, allowing our customers to experiment with the two frequencies in one easy to use device. We also wanted to add a few features to our Dual Frequency Zapper for convenience, such as a low battery light, color coded output ports, custom made red/black cables, and an easy open battery door (no screwdriver needed to change battery). When it came time to work with our engineers we wanted to be sure we were producing the best zapper ever made for following all of Hulda Clark's published zapper experiments. 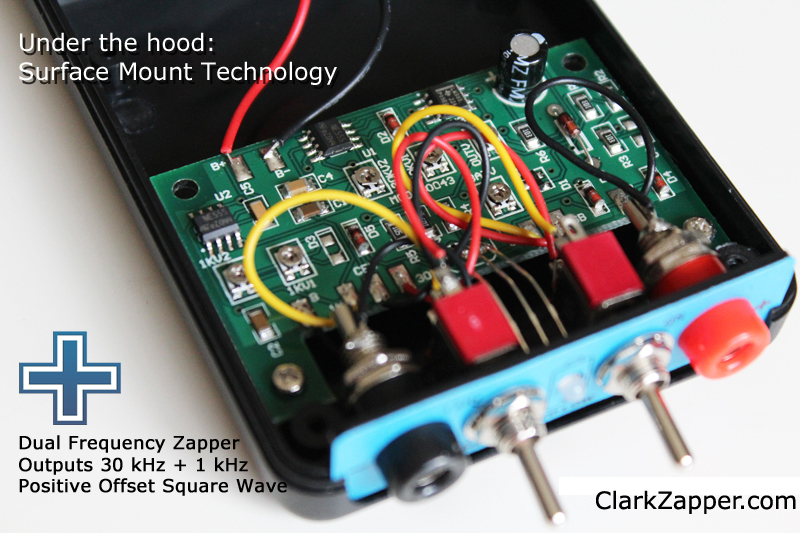 In 2003 Dr. Hulda Clark updated the zapper circuit so that the square wave was a 1/4 volt Positive Offset. Dr. Clark's redefinition of a zapper now included that the square wave must be a minimum 1/4 volt above the zero point when seen on an oscilloscope to avoid any negative spikes. Dr. Clark states that exact frequency, duty cycle, and voltage can all be approximate, however the Positive Offset must be 100% without any negative output. We asked that our engineers take the time to search for negative spikes when setting the square wave 1/4 volt Positive Offset. Testing: The most interesting moment of the design process is when we compared our output with several competitor zappers on the market today. Because the issue of 100% Positive Offset was so important we wanted to compare our new Dual Frequency Zapper's output with other zapper units. Most Hulda Clark Zapper circuits are based on the 555 CMOS timer. The 555 CMOS timer's number one job is to make square waves. From our observations on several different oscilloscopes, the 555 CMOS timer produced a natural surge or "blip" at the beginning of each square wave pulse, a small negative spike at the beginning of each square wave on every zapper we tested! Every zapper, including our competitor's zappers, were not always 1/4 volt Positive Offset due to the blip. Our engineers showed me that many oscilloscopes did not show the blip, only the most sensitive test units would show the blip, but it was alarming nonetheless to see their wave forms so close to the negative. Dr. Hulda Clark warns that even the most brief negative spike is undesirable, and those interested in following the zapping experiments found in Dr. Clark's books must be sure their zapper is 100% Positive Offset. The Solution: Because of the blip, we give our square wave enough Positive Offset by taking the 555 CMOS timer's natural negative surge in mind. This way there are no negative spikes in the output. The 1/4 volt Postive Offset begins at the lowest point of the wave form, which is the little elusive negative spike as warned about by Dr. Clark in her 2003 zapper update. It's amazing, but every answer and clue we needed when designing the Dual Frequency Zapper was always found in one of Dr. Clark's books. Above is an Infinite Horizons Inc. (IHI) B5 zapper which is one of the zapper units used at Dr. Clark's office. It is easy to see the blip causing a negative spike. It was at this moment we realized we had to build a better zapper than ever before. We tested several zappers from different vendors, and they all had the blip. This B5 unit is the exact zapper used in Dr. Clark's clinic, and it was so close to having negative spikes when tested on our oscilloscope. We began to worry about negative spikes coming from the 555 CMOS timer's natural surge before each wave form, and wanted to design our unit with it in mind. We literally obsess over options and solutions to be sure we were not wasting our time. Function and output are everything, and we did not quit until we found a working solution. Here is the Dual Frequency Zapper set to 30kHz. The zero point is marked on the left (it's the 1 with a little arrow). It is easy to see the little blip surge in the square wave, but it is also easy to see that the blip is above the zero point. We set the square wave above zero just enough so that the natural surge does not create a negative spike. Our square wave remains Positive Offset at all times blip and all. Almost all of our focus was on the Positive Offset of this zapper. We did test after test, and that's how we found the hard to detect spike to begin with. Since the Positive Offset is the most crucial function of the zapper, we needed to get in there, look closer than anyone ever has, optimize the circuit, and bring the best zapper ever produced to market. We feel real good about our Dual Frequency Zapper. The engineer crew provided the best service possible, and it made the production process feel like a success right from the start. Everyone involved delivered more than expected and a strong sense of camaraderie and fun was shared among the crew. There was an atmosphere that we were all doing our part to create the best product possible. It was awesome to have been part of that, and to have developed such a great product with so many diverse and interesting people. We can now share that positive experience with others who want only the very best in their lives. Thank you. We were very happy with the first version of our zapper. We took a lot of time and effort to ensure that our circuit is 1/4 Volt Positive Offset square wave. 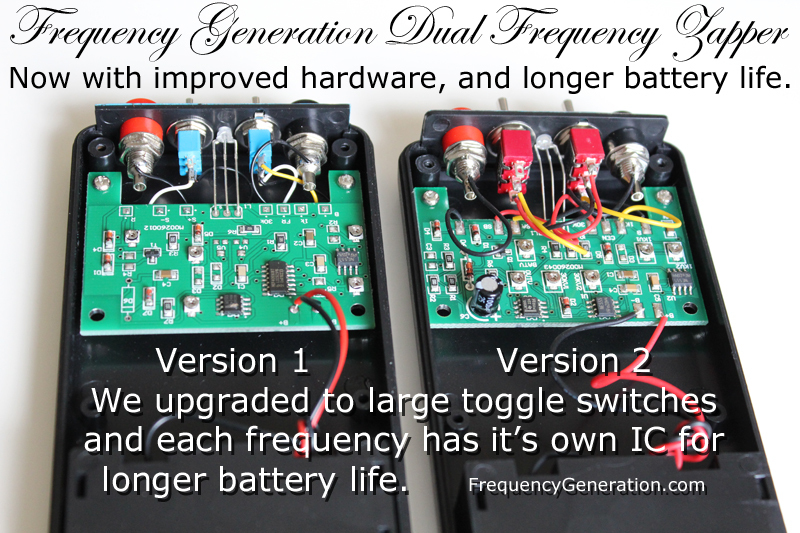 Read more about The Making of the Dual Frequency Zapper. Heavy Duty Toggle Switch. The only issues we had with the first batch was that 3 units needed their on/off switch replaced. We found a larger heavy duty toggle switch that will really do the job. We want these units to last forever, or a little longer, if possible. Longer Battery Life. We also posed the question, "What can we do to improve battery life?" Our engineers said, "It would cost more, but we could dedicate a separate integrated circuit for each frequency so that no energy would be lost during use." We decided that a little more investment on the price of the unit would be worth it, if it means a more economical use of 9-volt batteries. Risk Free Guarantee. 1 year satisfaction guarantee or your money back. Return the zapper unit, copper pipes, cables, and a copy of your invoice for a full refund (shipping not included). Dual Frequency Zapper Lifetime Repair or Replacement Guarantee. Coverage insures you for the electronic craftsmanship of the frequency generator unit. Replacement is our option for units that are beyond repair. Neglect/abuse of unit forfeits the guarantee. Wear and tear on copper handles, cables and 9-volt battery are not covered by the lifetime guarantee. Are you a shop owner or health practitioner? You may qualify for a Distributor's Discount. Apply here.